Хабаровск (Khabarovsk) - a city with a population of about a half million, located 30 kilometers from the Chinese border at the confluence of the Amur and Ussuri Rivers. Долина гейзеров (Valley of Geysers) - a remote area in Kamchatka with about ninety geysers which is listed as part of a World Heritage Site. Уфа (Ufa) - a city with a population of about one million people located in the Republic of Bashkortostan (Респу́блика Башкортоста́н). Белгород (Belgorod) - a city with about 350,000 residents located 40 kilometers from the border with Ukraine. Орск (Orsk) - a city which straddles the Ural River. 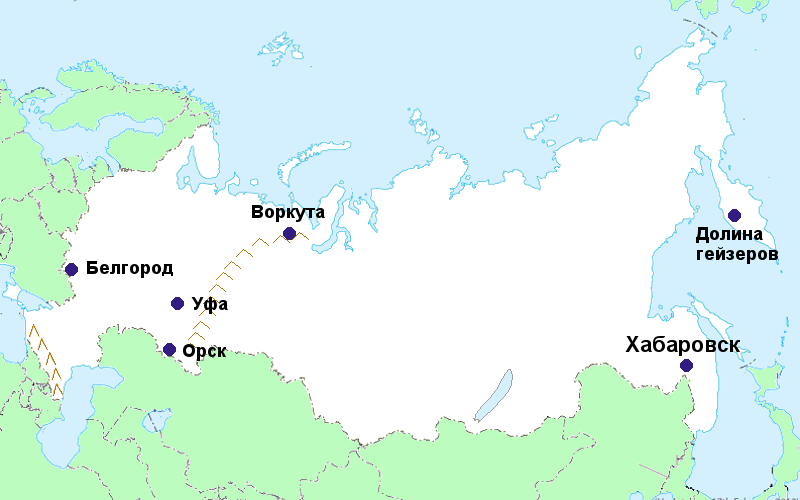 Since the western world considers the Ural River to be the boundary between Europe and Asia, Orsk can be said to be located in two different continents at the same time. Incidentally, the population of Orsk is about 250,000. Воркута (Vorkuta) - a coal-mining town located just north of the Arctic Circle along the Usa (Уса́) River. The population was once well over 100,000, but now is about 70,000.